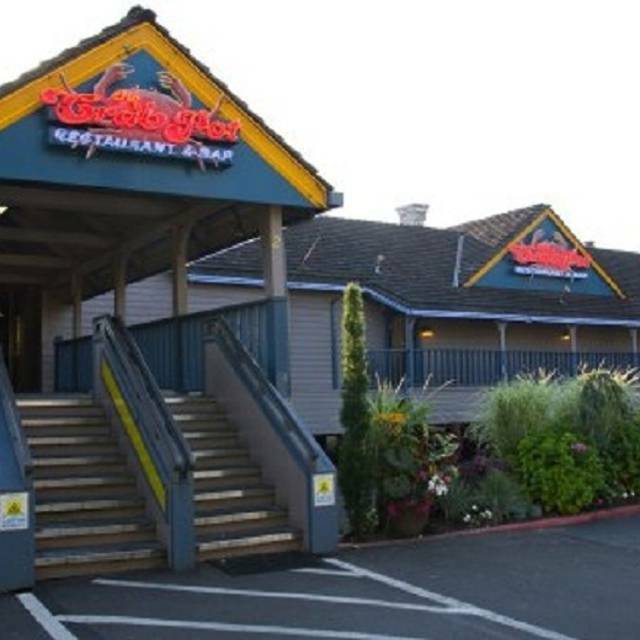 You must make reservations at least 5 minutes in advance of the time at The Crab Pot Restaurant & Bar - Bellevue. 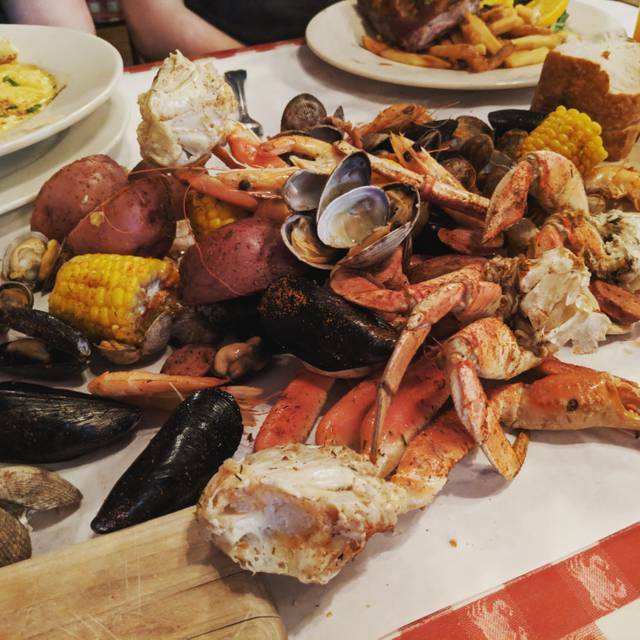 We take a variety of fresh seafood, steamed with mouth-watering spices, we pour it out on the table on butcher paper, give you a mallet, bibs & let you go at it! Or try one of our many other delicious entrees! The house specialty! Baked fresh daily. Rubarb, moist yellow cake, served with ice cream. For 2 or more! The one and only reason I would not recommend is because of an email I received later accusing me of a no show on my reservation and scolding me about how my missed reservation will "adversely affect the restaurant" and "we kindly ask that the next time you need a rain check, please do what you can to cancel the reservation." That spoiled my entire experience and has "adversely affected" any chance of my returning. 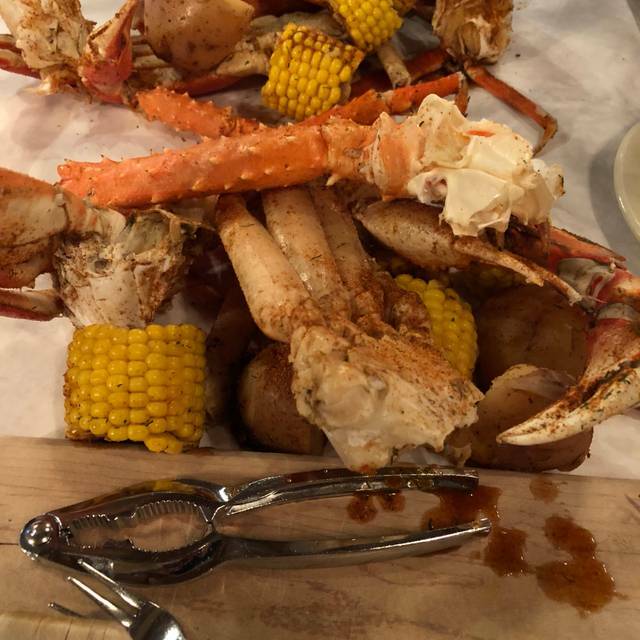 We went to Crab Pot for my adult son's birthday. There were 8 of us with a reservation of 5 p.m. on a Sunday. The place wasn't very busy when we arrived but filled up over the first hour. It took 30 minutes to get drinks and bread. It took over 1 hour to get our food. Our waitress was MIA almost the entire time, while the adjacent waitress was always visible getting her tables taken care of before us. The music being played was hip hop favorites, which seemed out of place/inappropriate for a family restaurant. When we arrived, the kitchen was blaring this music and it was very loud at the hostess stand. Food was okay. My mom's mussels were cold, but given how long it took to get food, she didn't want to send them back. My sister talked to the manager on her way out to give some constructive criticism and got the "we are abnormally busy" line = translation: "I don't care what you have to say" and it shows by how the restaurant is run. Never going again. Our waitress was the best, she accommodated is for a much longer stay than most families. We didn’t feel rushed. It was clean. We will be going here again. The location, food, service & experience was fabulous! Definitely a must visit restaurant! The food was good but the service was slow. Not sure what was going on but we had an early dinner and there were only a few tables occupied. Took nearly a half hour to get a drink, and our order wasn’t taken until a few minutes later. Server was friendly and quite possibly new to the restaurant. Over priced for seafood. The crab legs were still frozen and rubbery. 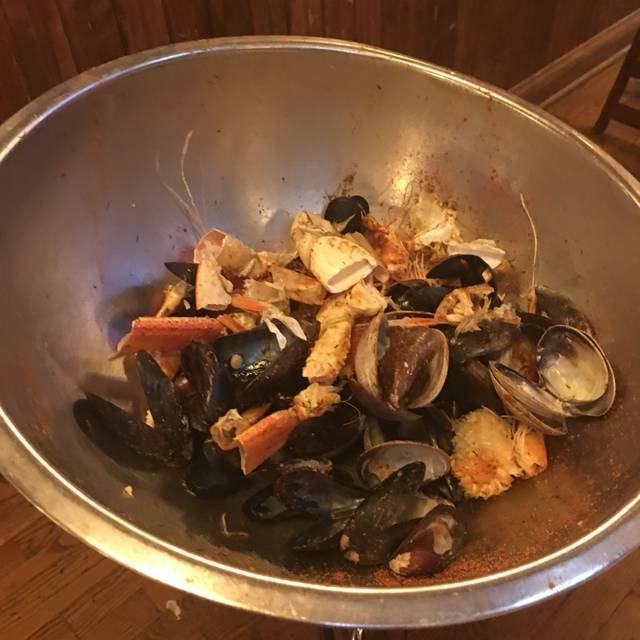 Our server was nice at first, but after she delivered our bowl of seafood, she never came back to see if we need anything further. We had to flag her down for more needs we needed. She made us feel like we were inconvenient her. I will never go back. I highly recommend for NOONE to go to this place. Highly priced seafood for fake seafood quality. Service is awful and food is very frozen. Not as crowded as the Pike Place location. Love the ambiance. Will be back!! Good food, nice to be on the water. We had the little ones, along with their parents, out for a Sunday lunch. It worked great for us with a good kids menu, lots of fun stuff for the kids to look at and great service. Food was fine -- my expectations were on par with the experience: pretty average but no complaints. We enjoyed our visit. My 6 year old loves seafood and every year we celebrate his birthday at the Crab Pot in Bellevue! Our server Samantha remembers us from last year! She took very good care of us!!! Samantha is awesome! Arriving on time for the reservation I did to only get there and wait an additional 15 minutes turns out my table wasn’t ready. Excellent Food and Great Customer Service. Also the quantity was good. We loved the Crab Pot on Valentine's Day - it is one of our favorite places! The food was great, our waitress was very busy but wonderful! We didn't feel pressured to hurry. We finished the evening with 2 rootbeer floats! We look forward to taking our granddaughter when she comes! We had lunch with friends on a Friday afternoon, and the restaurant was very quiet. We had a sweet, young man as our server. He did fine, management needs to train staff how to open wine bottles more neatly and efficiently, but we did not mind, just felt sorry for the poor guy. Considering how quiet things were our first batch of crab was just warm. Second order, made later, came out the perfect temperature. 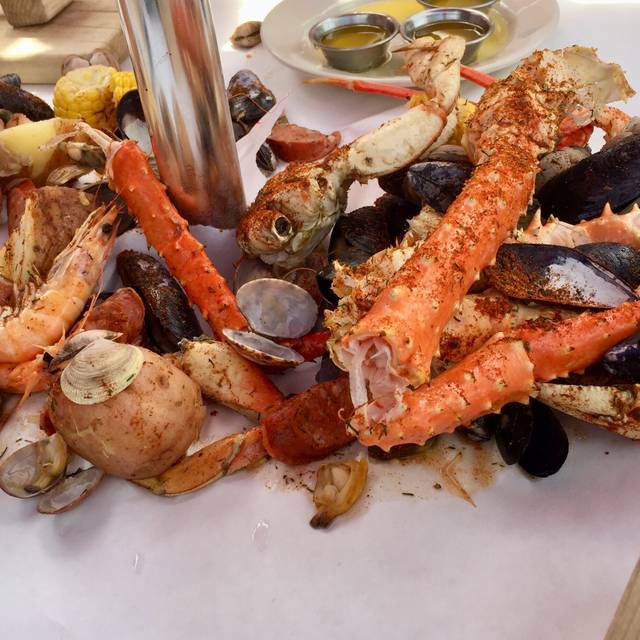 If you love crab and don't mind getting your hands a little messy - you MUST try out this reastaurant! A great place for large family gatherings. Waitress had too many tables, could've used help. Other than that and the lake sized puddle in the front, everything else was great. Service was slow but food was pretty good. I’ve visited at this Crabpot location in the past and it was really good. This most recent time however, it was significantly less positive. Dirty silverware, a very small “Deluxe” (expensive) burger and the overall food quality was sub par. The service was excellent and attentive, but we just couldn’t get past the food quality. Unfortunately I fee that this will be my last visit. Awful service, I played almost 300 dollars and it was a disaster overall. I could have better service at Chuck E Chesse's. Rude host, bad services, and bad place to celebrated birthdays. Birthday! Nice view, good location, food choices excellent. The food was great as usual. We had 2 orders of the crab crab n crab which was excellent, plus we had a crab cake appetizer which was also very tasty. The service was also excellent as usual. The ambience is casual and fun and it also helps that this particular crab pot location has ample parking. also I don't remember my server's name, but I always seem to sit in her section when I come here. She is excellent! We had a special birthday celebration and an anniversary to celebrate. Made reservations in advance. We’re seated on the very right of the bar side along the windows, far away from the main eating area. The restaurant was dead, but our server was never in sight. The service was horrible and after mentioning something to the waitress about having received more attention in the main eating area before, we were treated with an attitude. Very disappointing, especially since we’re frequent customers and have never received that kind of service - we probably would’ve gotten more attention heading to a local fast food restaurant. At all times we felt like we’re a burden to our waitress. Nonetheless, the food was outstanding as always. It was my fathers birthday and he loves seafood. We’d heard allot of good things, so I thought it be a good place to celebrate. I had noted on the reservation it was our fathers birthday and we’d like a nice table with a view of the water/pond by the window. We arrived, I let them know we had a reservation and the kid checked and agreed. He then took us to the middle of the restaurant, no view, no window. Just not good seating at all. My little sister spotted a better spot we asked to be moved and they did, very polite about it. Then came the interesting part. We made the bad decision to sit next to a table full of woman and 2/3 men. It looked like an episode of the bachelor, rose for each one of them and all. They were loud, distracted our waitress numerous times. Who which I may add was the BEST part of our dinning experience. She was super and when I say super I mean SUPER AWESOME! The only reason I’d go back there would be if she was my waitress only. Other than the people sitting next to us, we had a good time. We got the view, the food was good, we all ate plenty. My father had a good time. Our server Jordan was amazing! We were there for a friend’s birthday, and Jordan really helped make the experience extra special for our friend. So dang cold! It had to be in the 50’s inside. The food was overpriced for poor quality. Very run down restaurant. Our server was Daisy and she was excellent. The food was fantastic. 2 buckets of crab and they were perfect. Will go back! About 8-10 beers on tap, same number of wines by the glass. Featured cocktails are uninspired (an old fashioned, a martini, a lemon drop) and while it may technically be a full bar you really have to stick to the simplest cocktails - e.g. they couldn't make a sazerac due to missing ingredients. So go for the food and to make a mess with friends and family. Went here feeling like this would be a solid seafood place, not too pricey but good. It basically was the Denny’s of seafood spots. 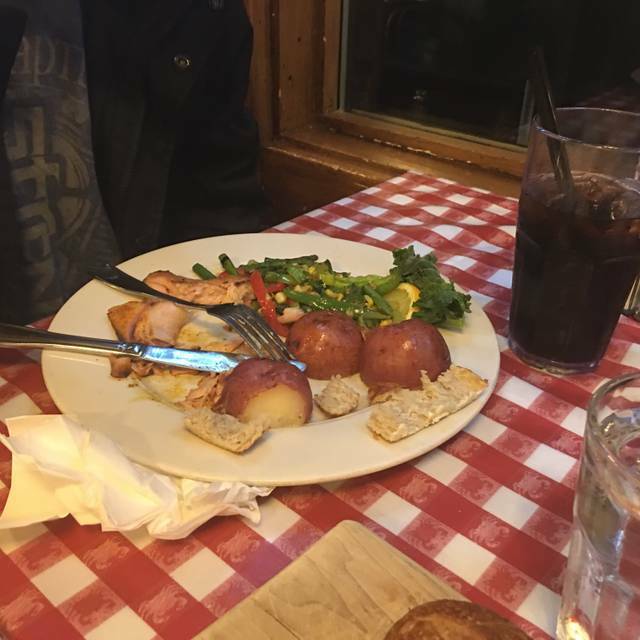 Meal wasn’t great, and in my opinion, you have to work hard to make a salmon filet be mediocre. Service was slow and not particularly competent. Forgot some of our order, efforts to be friendly were awkward and uncomfortable. The “lake” the restaurant is on is coated with pond scum and had a pungent odor that could be smelled in the building. Just an overall drab experience. Waitress got our order wrong. Said the buttons are close where she tells the chef. The “King Crab” pasta had almost no crab and was mixed with fillers. Poor taste, cheap pasta. Needless to say I will not be going back. Food was 1940’s disgusting. I had the clam pot with oyster shooters. 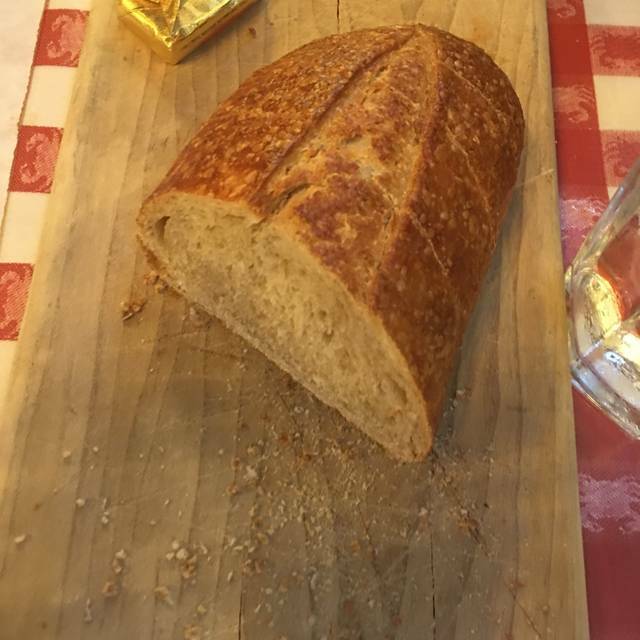 I had to ask for a couple of butter sides to get the food down. Good experience, ample parking spaces and food was decent. Great time as the food is great and the atmosphere is fun. This was our third visit so we brought our family and friends for a large table. Our waiter was too busy to be friendly or very helpful, and we ended up waiting on him too much. Win some lose some. Had one of their SeaFeast meals, in the deck, enjoying a gorgeous summer evening. So good!